Getting to the point — the real point — with specific details is the only you can bring clarity to a problem your customer may be having. Insightful copywriting shows you understand your customer by revealing a new level of depth in an issue they might not be able to see clearly. A guy called in to the Kim Komando show once with a complaint. He was looking for an IT solution for his school district, and all his IT people were scratching their heads because they couldn’t solve it within their tight budget. See, the caller was comparing his imagined solution to the wrong thing, He couldn’t accept the price because he was comparing the solution to a consumer’s price, not a B2B, or institutional price. He was frustrated because in his mind he assumed it was an IT problem instead of a budget problem. He had simply framed the problem incorrectly. Tim Robbins’ Ultimate Power is a powerful read for content marketers and copywriters. If you havent’ read it, or you think it might be too “out there,” I challenge you to give it a try. Our minds try to hold us back from success by filling our consciousness with generalities that are off-the-mark to begin with. We can only understand a problem in terms of our current awareness. In other words, we can’t know what we don’t know. Your customer is in the same boat. When she states her problem, you can understand her, based on the context of the situation, or simply because you’ve solved a similar problem for others like her. But in her mind, she just can’t see the problem clearly. And that’s half the problem! That’s where you come in. Next time you’re in a problem/solution situation, help your customer by applying details — details she’s provided, even! — to her problem. People simply don’t have the time or space to be less than their best if they think about problems in specific, accurate terms. This is where copywriting comes in, so consider these concepts as if you had to write an exploratory paper about your customer’s dilemma. You’ll quickly see how easy it is to address the problem, come up with a decent solution, and encourage your client to see it from a new vantage point. 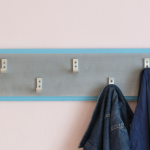 As a work-from-home mom with a business to run, I remember many summers when the kids would whine that there was “nothing to do!” Quickly coming up with a list of specific things for them to do was my solution. In a similar way, what I’m suggesting here is not to offer your customer a list of specific options to choose from; but rather to pose their questions as specifically as possible so that they can easily come to the same conclusion as you and see the ease with which their problem could be solved. When you show you understand, by merely reframing their problem with specific details, then you’ll be seen as an expert with an answer. I have some ideas for you today — ideas that can improve the way you put into words how your products and services help your customers. Here’s the thing. For most people, when something is bugging us, and especially when we haven’t quite decided to do something about it yet, we tend to linger around the problem like we’re lost in a cloud. It’s almost as if we enjoy being lost in the muddle. I always get within 10 pounds of my goal weight, then stop losing weight. Why try? I have no time for that project. How can I be so forgetful? Every time I attend that meeting, I end up frustrated. That class is too expensive. I can never hire the right person for the job. Can you see the relationship between all these phrases? At their core they hold no power because they are nebulous by nature. When you find yourself thinking about problems in this vague way, inspect them more closely to find the real hooks inside the issue. To show you can really serve your customer — and relay that with your copywriting, let’s rephrase each of the above complaints with a specific clause. Where, exactly, does the person get snagged up? I always get within 10 pounds of my goal weight, then stop losing. Why try? Should be: When I reach 125 pounds, I start adding old friends like chips and ice cream to my diet. How can I stay on target and resist those things? Should be: I would need to drop this other thing from my schedule if I were to work on that. Or I really don’t want to make time for that project, but maybe I can find someone who can help. Should be: I’m great about remembering to-do items for projects, so why do I forget the names of the clients at that company? How do I retain them? Should be: Who or what is it about that meeting that frustrates me? Can I avoid feeling frustrated by doing or saying something different? Should be: That class is expensive compared to this other one. What is the added value I would get from it? Should be: I find it difficult to stay on task when I’m studying. Once I settle into my work I’m ok, so how do I get rid of distractions so I can focus? Should be: Either my ads are attracting the wrong candidates or we don’t have an interview process that screens people well. Where can I get information about that? Now think about some of the common problems of your customers. Are people coming to you with a perceived problem that is unsolvable in their minds? It could be because the wording is intrinsically formatted in “loser” terms. I’m not saying that out of disrespect. You must show empathy by listening and repeating the things that are bugging them. Finally, don’t merely imagine your constituents’ problems. Verify your guesses by making yourself available on social media, in your communities, and through face-to-face networking with REAL people. In order to truly understand how to serve people better, you must engage in a real conversation with them. As you begin to offer help, that’s when it’s appropriate to define problems with specific words and phrases. 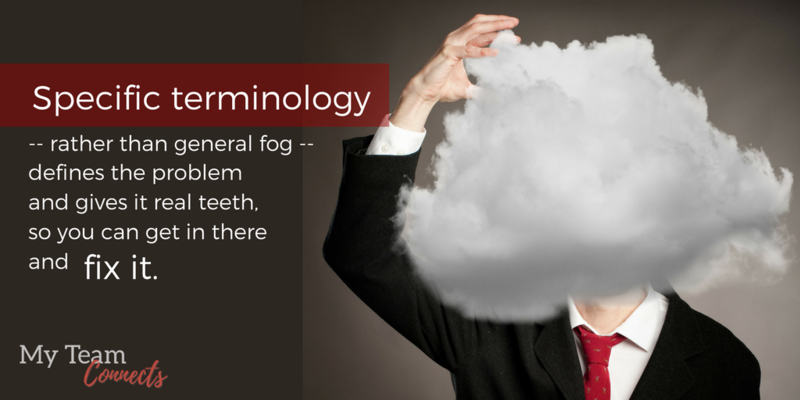 Specific terminology — rather than general fog — defines the problem and gives it real teeth, so you can get in there and fix it. If it weren’t for all the preconceived notions, and non specific ideas tumbling around in our heads, just imagine how productive we could be and how quickly we could come up with answers to our problems! Learn to let others help you when you can’t define a problem with certainty, and then learn to help others when you can see clearly through their brain fog. 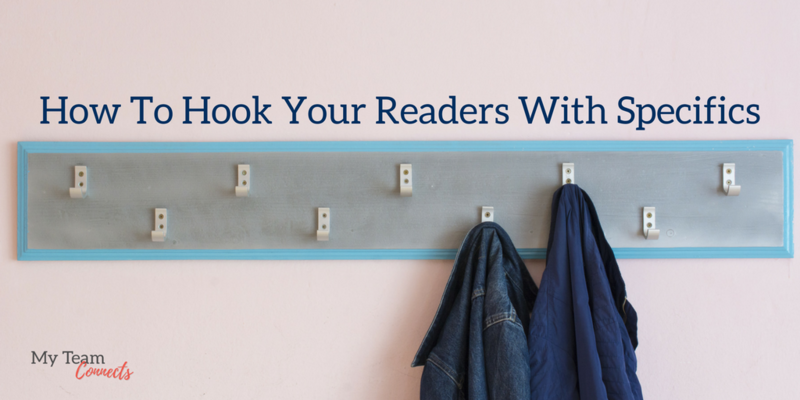 When writing and creating content for your audience, hook your readers with specific concepts that redefine their main problem. Want to take this discussion further? Let’s connect on Facebook. What’s the hardest part about finding the root of your customer’s nebulous problem?